Do you know what the best times to post on social media are for your business? In our Best Times to Post on Social Media Cheat Sheet, we analyzed more than 17.5 million social media posts by 17,737 brands to provide you with the best times to post on Twitter, Facebook, LinkedIn, Instagram, and Pinterest. 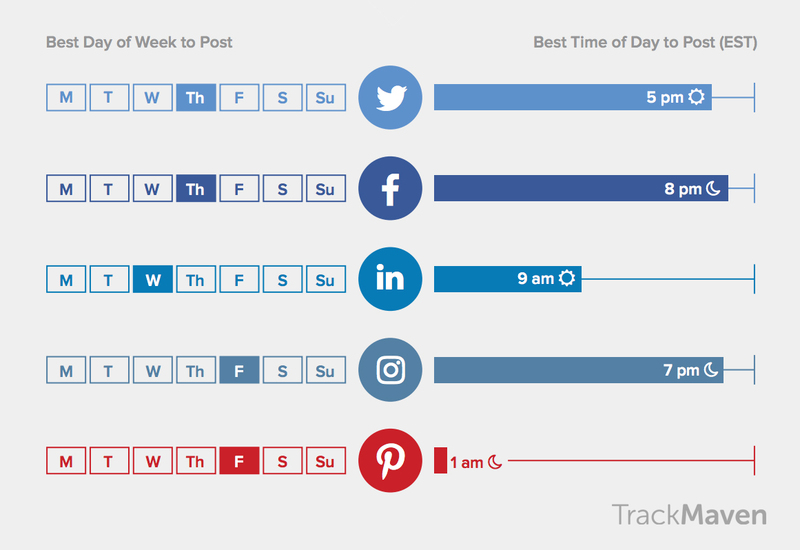 You’ll find the overall best day of the week and best time of day to post for each of the five social channels. But broad best practices will only take you so far. We take it a step further by breaking down the best day of the week and the best time of day to post for 75 industries. Download the Best Times to Post on Social Media + Cheat Sheet for 75 Industries now! We evaluated the best times to post based on the average number of interactions per post per 1,000 followers during each hour of the day and day of the week. Why do industry-specific best times to post matter? Industry-specific information for the best times to post on social media is incredibly important when considering how audiences interact with different content. The best time to post varies depending on what your brand is writing about and which audiences you are trying to reach. Why do businesses need to develop specific strategies for different social media channels? Our findings also highlight just how necessary it is for businesses to develop a channel-specific social media strategy for distributing their content. For each of the 75 industries in our cheat sheet, we examined the best times to post for five different social channels: Twitter, Facebook, LinkedIn, Instagram, and Pinterest. We found that even within industries, the best times to post vary by social network. For example, in the apparel and fashion industry, the best time to tweet is on Tuesdays at 12 p.m. EST, while on Pinterest, the best time to post is on Saturdays at 6 p.m. EST. Want to know what the best times to post on social are for your industry? Find out! Yes! I want this!Fill out the form below to download your free copy of the Best Times to Post on Social Media Cheat Sheet for 75 Industries.